Shakin’ All Over (Johnny Kidd and the Pirates, 1960). Shakin’ All Over (Tin Machine, live, 1989). Shakin’ All Over (as part of “Heaven’s In Here,” live, 1992). Another regular cover in the first Tin Machine tour was the band’s typically brass-knuckled take on Johnny Kidd’s “Shakin’ All Over.” Released in 1960 into a British pop market that had offered Cliff Richard as the UK’s answer to Elvis, Kidd’s “Shakin’,” with its lust-addled vocal, its creeping bassline and its cranked-up guitars, hit like a cannonball: “Shakin'” soon reached #1 and British rock bands would spend the next decade trying to live up to it (Led Zeppelin played a number of Kidd songs in their early rehearsals, while the Who kept trying to crack “Shakin'” on stage). With “Shakin'” originally intended as a B-side, the band was relaxed and loose for the take, which contributed to its spooky energy. Moretti’s solo, though preceded by an ill-timed drum fill that was left in to pad out the track, remains a marvel (it’s reminiscent of Vic Flick’s playing on Adam Faith’s “Made You,” though “Shakin'” was cut before the Faith track was released). Mick Ronson paid homage to Moretti by playing some of his lines in Bowie’s cover of “I Can’t Explain” on Pin Ups. Bowie had a history with the song: he had played “Shakin'” with some of his early bands (the Lower Third had opened for Johnny Kidd at the Isle of Wight, in the summer of ’65), as well as in the early 1970 Haddon Hall rehearsals that had generated most of the songs for the Man Who Sold The World. (Bowie reconnected with the drummer from that era, John Cambridge, at the Bradford gig on 2 July—Cambridge told him the lyric, which Bowie said he’d forgotten. )* But playing “Shakin'” with Tin Machine, Bowie just oversang, blowing his voice out on the choruses. Similar to their “Maggie’s Farm,” the Machine turned “Shakin'” into a mash-up, here a Fifties rock ‘n’ roll catch-all, with Kevin Armstrong playing Duane Eddy riffs throughout while Bowie seemed on the verge of spinning into other “period” hits—“Whole Lotta Shakin’ Going On” and Sam Cooke’s “Shake”—as if he was back on the Cher Show. So the Machine took a 1960 track that sounded like nothing else from its era, a proto-modernist hard rock groove song, and turned it into an “oldie”; the audience cheered them for it. In the 1991-92 tour, Bowie incorporated “Shakin'” into his long “Heaven’s In Here” medleys. More shakin’: Ziggy Stardust inspiration Vince Taylor, The Shindogs, The Who, Swinging Blue Jeans, the Guess Who, Suzi Quatro, Wanda Jackson with Jack White, Eilen Jewel. * This was an odd claim, as Bowie had sung “Shakin'” a few times before Bradford. Perhaps he’d just been mumbling his way through the lyric before then. 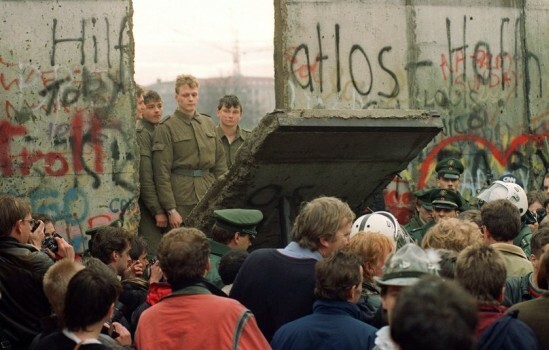 Top to bottom: the Wall comes down, Berlin, November 1989. This entry was posted on Tuesday, June 19th, 2012 at 11:32 am and is filed under EMI Years: 1983-1990. You can follow any responses to this entry through the RSS 2.0 feed. Both comments and pings are currently closed. I had no idea Tin Machine covered this live (but then I never really had the need to care about this band much). The version that I listen to is Iggy’s from the Avenue B album. Quite different from the original, a different kind of sexiness. Remains my favourite version. As for the Tin Machine version: not great, not bad. I actually don’t mind Bowie’s voice sounding hoarse there. It’s the 50’s thing that turns me off, makes it sound more dated than the original…Gabrels’s solo saves it a wee bit. The original is more inspiring and perhaps it even inspired the similar-sounding riff can be found on the Television song Call Mr. Lee, which is more fun than listening to Shakin’ All Over by TM, I must admit. This must be the nadir of the initial TM era. Which reminds me – isn’t there heaps of out-takes from the second TM album? could be dreary going through them! jeremy–blessedly the TMII outtakes are mainly just alternate mixes/early versions of released tracks so no need for separate entries. My fav cover version is by the who and even that I struggle with , tin machines version is just horrendous why did they even bother. Great piece of writing again , I feel for you having to write about such dross. I have to say, I’m not exactly thrilled by Tin Machine’s cover of this song. I think it’s rather ill-served by the “oldie mash-up” approach to the arrangement. BTW, another version of this song with a Bowie connection (although I don’t think he plays on it) is the one Mott The Hoople recorded during the sessions for All The Young Dudes in 1972, with their original frontman-turned-road manager Stan Tippins on lead vocals.